This is starting to become a little more of a food blog than anything else. :P But what can I say - nowadays the main highlights of my week happen to be the weekends when I get to bake/cook and leisurely/lovingly take some photos. This next two weeks is meant to be revision weeks for me but that also means (I hope!) a slightly more flexible schedule. First thing I did was plan out a bunch of meals that I want to make for myself from breakfasts/lunches/dinners to desserts. And since Friday was a public holiday, it was the perfect day to get started. 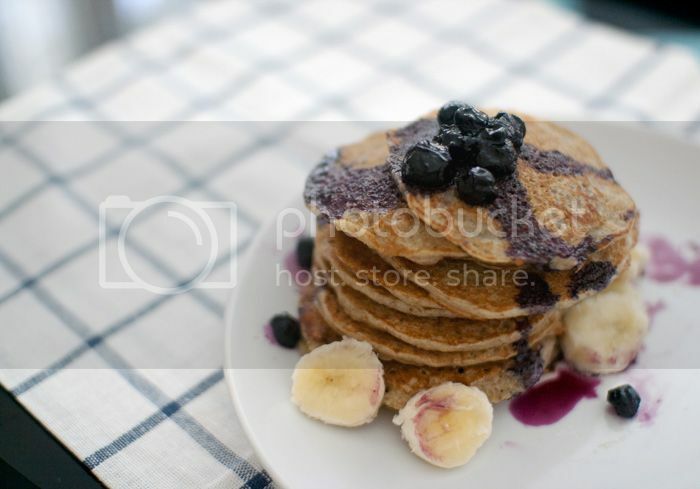 :)) What better way to start off the day than with home-made pancakes? And since I've got a little health-conscious streak in me (I do! I really do!! ), I decided to try making whole wheat ones at that. Agreed? It's pretty common sense right? But took me my first batch of large wobbly pancakes to realize that. To tell you the truth, though the smaller pancakes look prettier to me, I still prefer the large ones. More traditional. And there's nothing like needing to use a knife to cut out sections of a huge pancake to slowly chew on and savor. #1: In a large bowl beat eggs. Add buttermilk, butter and vanilla and mix well. Then add your two types of flour, sugar, baking powder, baking soda, and salt. Mix well until mostly smooth. #2: Heat griddle or pan over medium heat. Add a teaspoon of oil to the pan or spray with cooking spray. #3: Use a ladle to pour out batter onto the griddle. You can use 2 tablespoons or if you'd like really small ones like the ones I made the second time round, I sort of used only 1 tablespoon of batter each time. #4: Cook on the first side until bubbles form across the surface and start to pop. Check occasionally to make sure the bottom is not overcooking by gently lifting up the sides. It also helps to loosen the pancake for the flipping part. Flip the pancake over with a spatula and cook until golden brown. This batter makes quite a lot of pancakes! I'd say if you've only got 2-3 people with Asian appetites ;p it's better to halve the batter. If you have unfinished batter just keep it refrigerated for the next day. For the blueberry syrup, I decided to make use of the maple syrup that I'd brought back all the way from Montreal those months ago. Finally! I've been meaning to check out maple syrup recipes but never quite got around to doing so. This was the perfect opportunity. 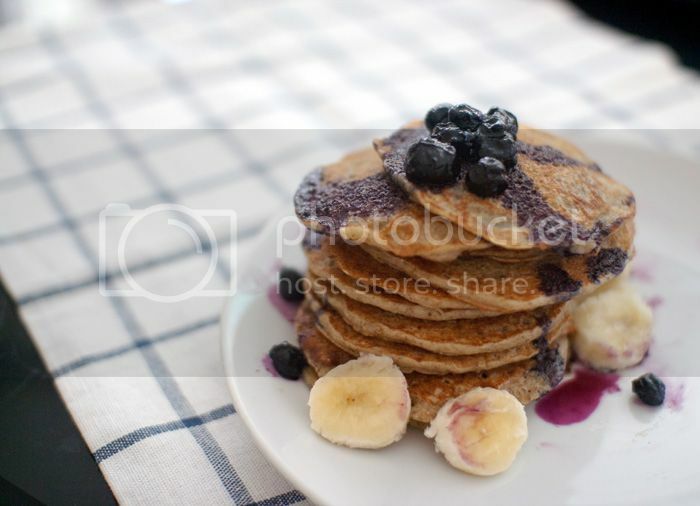 #1: In small saucepan, bring blueberries and maple syrup to boil. Reduce heat and simmer until berries break up, about 5 minutes. #2 : Stir in the lemon juice and corn starch to let it thicken slightly. Kinda happy with the way these turned out. :) Seriously, whenever something I cook/bake turns out edible I'm still pleasantly surprised deep down inside. Cheap thrill, I know, but I like feeling happy about the stuff I cook! I'm thinking of trying out waffles next...Or what else is a typical breakfast/brunch dish? 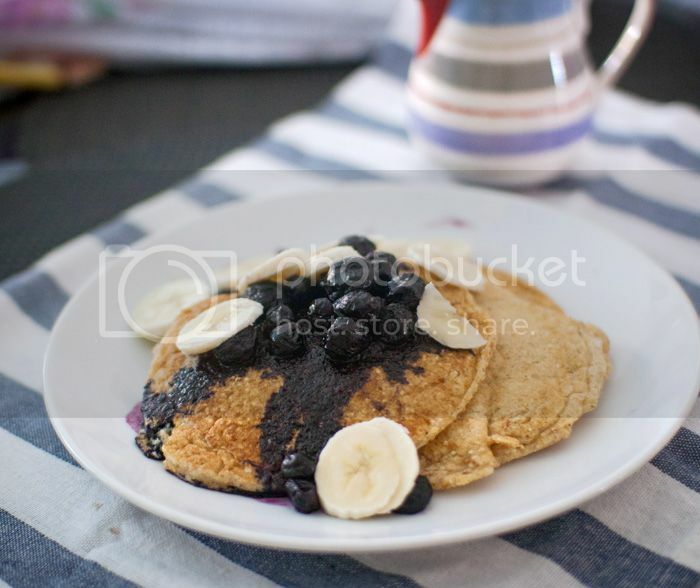 yum - im desperate to start trying to cook with wholewheat flour and thought pancakes would be a good place to start as you wouldn't mind pancakes being a bit chewier and denser! 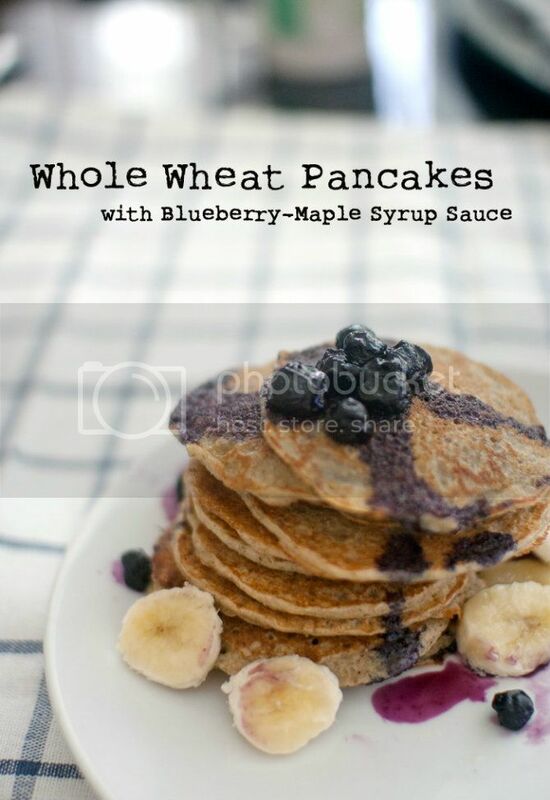 we were looking for whole wheat pancake mix this past weekend but couldn't find any in stores... never crossed my mind to make the batter myself! this looks so yummy. This looks so beautiful and delicious! i'm glad you said it turned out well because I try to eat whole wheat but a lot of times, it doesn't taste as good!